fee; please call for delivery details. Not valid for online ordering. Promotional value expires 60 days after purchase. Take a break from the kitchen with this deal for 27% off an extra-large specialty pizza, an appetizer and dessert from Donny's Pizzeria in Arlington Heights ($33 value). Warm up your palate with the chicken tenders, fried ravioli or jalapeno poppers, then delve into one of Donny's many specialty pizzas, like the Mega Meat Lovers or Donny's Monster pizza. Top off your meal with deep-fried oreos or a rich and creamy slice of cheesecake. 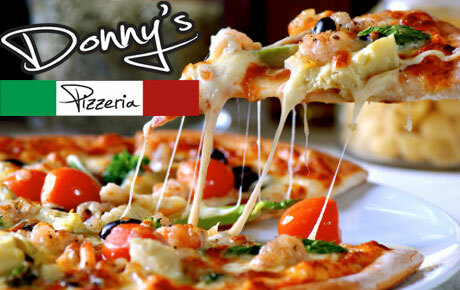 Donny's Pizzeria offers a variety of pizzas including deep-dish, thin-crust and stuffed pies. Their assorted list of toppings will add a fresh flavor to any slice. Try customer favorites like La Paisana, topped with fresh tomato, garlic and basil, or their popular Italian beef and giardinera pie. Donny's also serves delicious onion rings and their specialty, deep-fried pickles. Get a delicious and fulfilling meal with this deal. Delivery available in Arlington Heights, Rolling Meadows, Elk Grove Village, Mt. Prospect and Des Plaines.